Copies of the gospels were made in many different sizes and presented in a variety of ways because of the multiple roles that this essential Christian text played. Besides being read aloud during services and meditated upon privately by clergymen and monks, the gospels were also studied as the basis of Christian theology. Commentaries, sermons and homilies were written on the individual gospels, such as the commentary by St Augustine of Hippo on the Gospel of John. 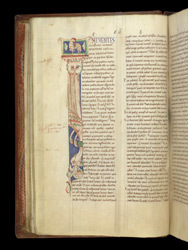 A manuscript of Augustine's from Rochester has bound with it a portion of the Gospel of John so that the reader might consult it when studying the sermons and possibly writing a sermon for delivery in the cathedral. The sermons by Augustine begin with their first letter 'I' enlarged to nearly the height of the page. A picture of the 'Lamb of God', the image of Jesus as the sacrifice, tops the letter. From the corners of the picture's frame, eagle heads protrude, symbols of John the Evangelist. A lion-like monster head devours another imaginary winged animal whose long body forms the main part of the letter. These imaginary animals are typical of 11th- and early 12th-century decoration in England. The sermon is on the first words of the Gospel of John.